Figure 2 compares the historical LULUCF trend from our analysis with three other well-known global LULUCF data sets: (i) latest country reports to UNFCCC (refs 13,15,16,20); (ii) FAOSTAT for all land uses23; and (iii) IPCC Fifth Assessment Report (AR5) Working Groups (WG) I5 and III6 data used for the global carbon budget. Figure 2: Comparison of historical LULUCF net GHG flux from this analysis and other key global LULUCF data sets. (1) Net GHG flux from latest country reports to UNFCCC13, 15, 16, 20 (grey line); (2) net GHG flux from FAOSTAT23 (orange line); and (3) net land-use sector CO2 anthropogenic flux included in IPCC AR55, 6 using data from the Houghton bookkeeping model27, 50 (green line). This analysis (black line) uses a combination of GHG data from the following countries’ sources (in order of priority): data submitted to UNFCCC ((I)NDCs3, 2015 GHG Inventories13, recent National Communications15, 20); other countries’ official documents; FAO-based data sets, that is, FRA 201522 for forest (as elaborated by ref. 8) and FAOSTAT23 for non-forest land-use emissions. Given the small share of non-CO2 gases in the total LULUCF GHG budget (which excludes non-CO2 GHG emissions from agriculture—see Methods for details), the different coverage on non-CO2 gases does not represent an important reason for discrepancy between data sets. 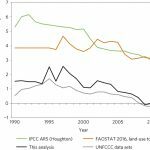 Whereas for all data sets emissions are decreasing over time, the slopes of the linear trends are different between this analysis, the IPCC AR5 and FAOSTAT (95% confidence interval). The difference between this analysis and the UNFCCC country reports is because several (I)NDCs updated past data sets, and because we used FAO-based data for gap filling, instead of pre-2010 National Communications. 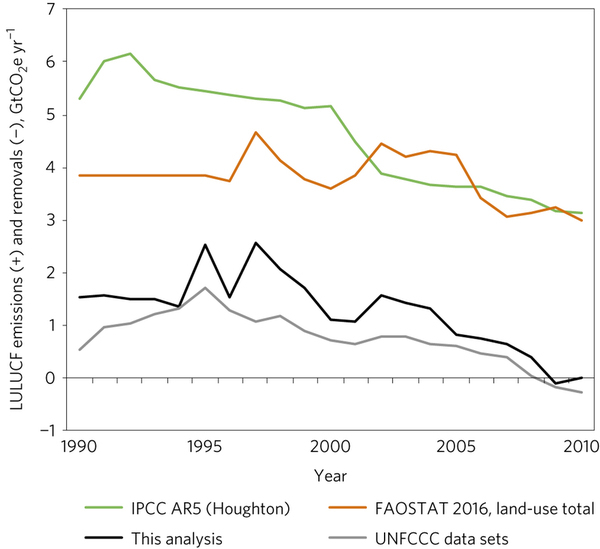 Differences between this analysis and FAOSTAT include the definition of forest (UNFCCC versus FAO); coverage of areas and of carbon pools; and differing estimation methods by reporting agencies8 (see Methods). 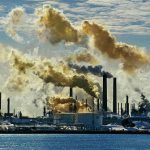 There is a large difference of about 3 GtCO2e yr−1 between this analysis, based on country reports following the IPCC Guidelines for National GHG Inventories25, 26 (IPCC GL), and the scientific studies summarized by the IPCC AR55, 6, For the period 2000–2009, the level of net emissions is on average 0.90 ± 1.11 GtCO2e yr−1 (95% CI) in our analysis and 4.03 ± 2.93 GtCO2e yr−1 (90% CI, reflecting both methodological and terminological choices27, 28, 29) in IPCC AR5 (Fig. 2). The above differences are linked to different scopes of the two IPCC work streams30: the GL focus on internationally agreed methodologies for national anthropogenic GHG estimation, recognizing different countries’ definitions and technical capabilities, whilst the AR5 focuses on assessing the state of the science on the global carbon budget using globally applied data, definitions and modelling methods. Specifically, LULUCF in the IPCC GL includes estimates of GHG emissions and removals from all land uses, reported under either a stable or changed land-use status (typically in the last 20 years), for example, ‘forest remaining forest’ or ‘forest converted to cropland’ (or vice versa). There is a large scientific challenge of providing a practicable methodology to factor out direct human-induced mitigation action from indirect human-induced and natural effects31, 32, such as the natural ageing of forests, natural disturbances and environmental change (for example, climate change, extended growing seasons, fertilizing effects of increased [CO2] and nitrogen deposition). Therefore, the IPCC GL25, 26 use the category of ‘managed land’ as a default first-order approximation of ‘anthropogenic’ emissions and removals, based on the rationale that the preponderance of anthropogenic effects occurs on managed land32. The GHG inventories should report all emissions and removals for managed land, while GHG fluxes from unmanaged land are excluded. What is included in ‘managed land’ varies from country to country, although the countries’ definition must be applied consistently over time. 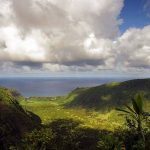 In contrast, global models such as those used in IPCC AR5 and the Global Carbon Project take a different approach to separate anthropogenic from natural effects. Anthropogenic fluxes (referred to as ‘net land-use change’5, 9, or ‘Forestry and Other Land Uses’6) are estimated by a bookkeeping model27 or by dynamic global vegetation models9 based on changes in land cover (that is, between forest and agriculture), forest regrowth and, depending on the modelling capability, some forms of management (wood harvest and shifting cultivation). The difference between this modelled ‘anthropogenic’ flux and the estimated total net flux of CO2 between the land and atmosphere9 is the ‘residual terrestrial sink’5, 6, 9, which is generally assumed to be a natural response of primary or mature regrowth forests to environmental change9, 27. The above methodological differences are reflected in the net emissions from developed countries, where most of the ≈3 GtCO2e yr−1 difference between our analysis and IPCC AR5 occurs for the period 2000–2009: while these countries report a substantial ‘anthropogenic’ sink (−1.9 GtCO2e yr−1 in ‘UNFCCC Annex 1’ countries), the bookkeeping model (IPCC AR5) finds a small net source (0.1 GtCO2e yr−1, ‘OECD’ in Fig. 1.7 of ref. 6). This difference lies essentially in whether the large sinks in areas designated by countries as ‘managed forest’ (following IPCC GL), well documented in forest inventories10, are attributed to ‘anthropogenic’ (in the GHG inventories) or to ‘natural’ fluxes (in IPCC AR5). To explore, at least in part, the impact of these different attribution methods, Fig. 3a compares what is considered undisputedly ‘anthropogenic’ by both IPCC AR5 (land-use change) and the country reports (land converted to other land uses). These estimates, both predominated by tropical deforestation, are of similar magnitude, especially after 2000. The other fluxes, where the attribution differs more between IPCC AR5 and the countries, are shown in Fig. 3b. Thus, much of the sink that countries report under ‘forest remaining forest’, the global models consider part of the natural flux. This disaggregation suggests that the residual sink is at least partly influenced by management practices not captured by global carbon models33, but also that countries consider anthropogenic what is partly influenced by environmental change and by recovery from past disturbances. 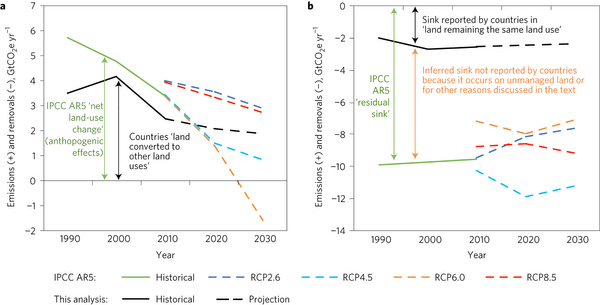 Figure 3: Comparison of historical and projected land fluxes from this analysis (based on country reports, including conditional (I)NDCs) and IPCC AR5 (based on global models and the projections of the four Representative Concentration Pathways (RCP) scenarios). a,b, For this figure we have disaggregated between fluxes undoubtedly considered ‘anthropogenic’, that is, anthropogenic CO2 fluxes according to IPCC AR5 (‘net land-use change’5, or ‘Forestry and Other Land Uses’6), dominated by changes in land cover (but including also some forms of forest management, see text for details) versus country GHG fluxes from this analysis separated out to show only net flux from ‘land converted to other land uses’ (a) and fluxes where the attribution between ‘anthropogenic’ and ‘natural’ effects differs at least in part, that is, residual terrestrial sink of CO2 according to IPCC AR55, 6 (considered largely ‘natural’) versus country GHG fluxes from this analysis separated out to show only net flux from managed ‘land remaining the same land use’ (assumed ‘anthropogenic’) (b). To make estimates more easily comparable with IPCC AR5, projections from this analysis were averaged over 10 yr (2010 = average 2005–2014). For the separation of ‘land converted to other land uses’ from ‘land remaining under the same land use’, see Methods. Historical anthropogenic flux data in IPCC AR55, 6 are from Houghton’s bookkeeping model27, 50, with the residual sink data as presented in WGI table 6.1 and WGIII table 11.2. The RCP data come from ref. 51 (Tables AII.2.1.b and AII.3.1a). Given the small share of non-CO2 gases in the total LULUCF GHG budget (which excludes non-CO2 GHG emissions from agriculture—see Methods for details), the different coverage on non-CO2 gases does not represent an important reason for discrepancy between data sets. There are many reasons for the lower sink reported by countries in Fig. 3b compared with the residual sink from IPCC AR530, including the fact that countries do not report sinks for unmanaged lands (for example, a large sink in tropical and boreal unmanaged forests10) and their reporting for managed land may be incomplete, that is, ignoring fluxes (for example, sink in grasslands, wetlands or forest regrowth) or carbon pools. There would be other factors to consider, including treatment of legacy fluxes from past land-use and other definitional and methodological differences. These would require a more detailed analysis, which is outside the scope of this paper. Finally, the projections from this analysis can be compared with RCP scenarios used in IPCC AR5 up to 2030 (Fig. 3, dashed lines). For the undoubtedly ‘anthropogenic’ fluxes (Fig. 3a), our country data analysis falls broadly within the IPCC AR5 scenarios, supporting previous qualitative findings34. Overall, our analysis shows (1) that various global LULUCF data sets may be more consistent than apparent at first glance, (2) unless the scientific and GHG inventory community appreciate these definitional and methodological issues, conflicting numbers and messages are likely to appear in the coming years, and (3) that several reasons for the differences among data sets can be further reconciled in collaboration between the two communities, which would be a very useful contribution to science and policy.